On the right of the admin area there is a section containing links to the template creator. Choose which size and type of template you wish to create by clicking the buttons. You can choose from 13x13 and 15x15 Standard UK, American Style and Freeform. Please make sure you create the correct type of template for the selected format. If you create the wrong style of template it will not appear in the correct list and your completed crosswords will not be listed correctly or possibly not at all. Note: When creating templates the across and down numbering is automatic Make sure there are no single character words. As a general rule no words less then three characters are acceptable. If you create a crossword from a template that does not really work it may be completed as a personal crossword and not fully available online. Standard UK Style generally follows a symmetrical pattern with a high degree of black squares creating a lattice type effect. Normally, for example, if the top row contains across answers you would not get an across answers on the second row but the third. American Style templates again are normally symmetrical but have predominately white space with minimal black squares. Freeform Style grids are generally used for themed crosswords where the answers are pre-defined and will not necessarily fit neatly into a strict grid pattern. 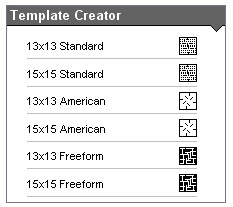 Freeform templates will most often have a greater majority of black squares. Basically for this compiler if the grid you create does not fit into the Standard UK Style or American Style it should be classed as a Freeform template.